Sterling "Old Pap" Price (September 14, 1809 – September 29, 1867) was an American lawyer, planter, soldier, and politician from the U.S. state of Missouri, who served as the 11th Governor of the state from 1853 to 1857. He also served as a United States Army brigadier general during the Mexican–American War, and a Confederate Army major general in the American Civil War. Price is best known for his victories in New Mexico and Chihuahua during the Mexican conflict, and for his losses at the Battles of Pea Ridge and Westport during the Civil War–the latter being the culmination of his ill-fated Missouri Campaign of 1864. Prince Edward County, Virginia, U.S. Following the war, Price took his remaining troops to Mexico rather than surrender. He unsuccessfully sought military service with Emperor Maximilian there. He ultimately returned to Missouri, where he died in poverty. He was buried in St. Louis. Sterling Price was born near Farmville, in Prince Edward County, Virginia on September 14, 1809, into a family of Welsh origin. His father was Pugh Price, whose ancestor John Price was born in Brecknock, Wales, in 1584 and settled in the Virginia Colony in the early 1600s. His mother was Elizabeth Williamson. Price attended Hampden–Sydney College in 1826 and 1827, studying law and working at the courthouse near his home. He was admitted to the Virginia bar and opened a law practice. In the fall of 1831, Price moved with his family to Fayette, Missouri. A year later, they moved to Keytesville, Missouri, where he ran a hotel and mercantile business. On May 14, 1833, he married Martha Head of Randolph County, Missouri. They had seven children, five surviving to adulthood: Edwin Williamson, Herber, Celsus, Martha Sterling, and Quintus. During the Mormon War of 1838 in western Missouri, Price served as a member of a delegation sent from Chariton County to investigate reported disturbances between the Latter Day Saints and anti-Mormon mobs. His report was favorable to the Mormons, stating they were not guilty of any offenses and that in his opinion the charges had been brought by their enemies. Following the Mormon capitulation in November 1838, Missouri governor Lilburn Boggs ordered Price to lead a company of men to protect the Mormons from further depredations. Price was elected to the Missouri State House of Representatives, serving one term from 1836 to 1838, and again for two terms from 1840 to 1844. During the latter terms, he was chosen as its speaker. He was elected as a Democrat to the 29th United States Congress, serving from March 4, 1845, to August 12, 1846, when he resigned from the House to serve in the Mexican–American War. Price raised the Second Regiment, Missouri Mounted Volunteer Cavalry and was appointed as its colonel on August 12, 1846. He marched his regiment under Alexander Doniphan to Santa Fe, where he assumed command of the Territory of New Mexico after Gen. Stephen W. Kearny, departed for California. Price served as military governor of New Mexico, and put down the Taos Revolt in January 1847, an uprising of Native Americans and Mexicans. Price became a slave owner and planter, cultivating tobacco on the Bowling Green prairie. Popular because of his war service, he was easily elected Governor of Missouri in 1852, serving from 1853 to 1857. During his tenure, Washington University in St. Louis was established, the state's public school system was restructured, the Missouri State Teachers Association was created, the state's railroad network was expanded, and a state geological survey was created. Although the state legislature passed an act to increase the governor's salary, Price refused to accept anything more than the salary for which he had been elected. Price was appointed as the state's Bank Commissioner, serving from 1857 to 1861. He also secured a rail line through his home county, which became part of the Norfolk and Western Railway. Price was initially a strong supporter of the Union. He backed Stephen A. Douglas for president in 1860. When the states of the Deep South seceded and formed the Confederate States of America, Price opposed secession by Missouri. He was elected presiding officer of the Missouri State Convention on February 28, 1861, which voted against the state leaving the Union. The situation changed markedly, however, when pro-Union Francis Preston Blair, Jr. and Capt. Nathaniel Lyon seized the state militia's Camp Jackson at St. Louis. Outraged by this virtual declaration of war against the state, Price gave his support to the secessionists. Pro-Confederate Governor Claiborne Fox Jackson appointed him to command the newly reformed Missouri State Guard in May 1861, and Price led his recruits (who nicknamed him "Old Pap") in a campaign to expel Lyon's troops. By then they had seized the state capital and pushed through a bill to remove Governor Jackson from office and replace him with an unelected Union governor. The climax of the conflict was the Battle of Wilson's Creek, fought on August 10, where Price's Missouri State Guard, supported by Confederate troops led by Brigadier General Benjamin McCulloch, soundly defeated Lyon's Army of the West; the Union general was killed during the battle. Price's troops launched an offensive into northern Missouri, defeating the Federal forces of Colonel James Mulligan at the First Battle of Lexington. However, the Union Army soon sent reinforcements to Missouri, and forced Price's men and Governor Jackson to fall back to the Arkansas border. The Union retained control of most of Missouri for the remainder of the war, although there were frequent guerrilla raids in the western sections. Still operating as a Missouri militia general (rather than as a commissioned Confederate officer), Price was unable to agree with his Wilson's Creek colleague, Brigadier General Benjamin McCulloch, as to how to proceed following the battle. This resulted in the splitting of what might otherwise have become a sizable Confederate force in the West. Price and McCulloch became such bitter rivals that the Confederacy appointed Maj. Gen. Earl Van Dorn as overall commander of the Trans-Mississippi district. Van Dorn reunited Price's and McCulloch's formations into a force he named the Army of the West, and set out to engage Unionist troops in Missouri under the command of Brig. Gen. Samuel R. Curtis. Now under Van Dorn's command, Price was commissioned in the Confederate States Army as a major general on March 6, 1862. Outnumbering Curtis's forces, Van Dorn attacked the Northern army at Pea Ridge on March 7–8. Although wounded in the fray, Price pushed Curtis's force back at Elkhorn Tavern on March 7, but the battle was lost on the following day after a furious Federal counterattack. Price, now serving under Van Dorn, crossed the Mississippi River to reinforce Gen. P. G. T. Beauregard's army in northern Mississippi following Beauregard's loss at the Battle of Shiloh. Van Dorn's army was positioned on the Confederate right flank during the Siege of Corinth. During Braxton Bragg's Confederate Heartland Offensive, Van Dorn was sent to western Mississippi, while Price given command of the District of Tennessee. As Bragg marched his army into Kentucky, Bragg urged Price to make some move to assist him. Not waiting to re-unite with Van Dorn's returning forces, Price seized the Union supply depot at nearby Iuka, but was driven back by Maj. Gen. William S. Rosecrans at the Battle of Iuka on September 19, 1862. A few weeks later, on October 3–4, Price (under Van Dorn's command once more) was defeated with Van Dorn at the Second Battle of Corinth. Van Dorn was replaced by Maj. Gen. John C. Pemberton, and Price, who had become thoroughly disgusted with Van Dorn and was eager to return to Missouri, obtained a leave to visit Richmond, the Confederate capital. There, he obtained an audience with Confederate President Jefferson Davis to discuss his grievances, only to find his own loyalty to the South sternly questioned by the Confederate leader. Price did secure Davis's permission to return to Missouri—minus his troops. Unimpressed with the Missourian, Davis pronounced him "the vainest man I ever met." Price was not finished as a Confederate commander, however. He contested Union control over Arkansas in the summer of 1863, and while he won some of his engagements, he was not able to dislodge Northern forces from the state, abandoning Little Rock for southern Arkansas. In early 1864, Confederate General Edmund Kirby-Smith, in command of the Western Louisiana campaign, ordered General Price in Arkansas to send all of his infantry to Shreveport. Confederate forces in the Indian Territory were to join Price in the endeavor. General John B. Magruder in Texas was instructed to send infantry toward Marshall, Texas, west of Shreveport. General St. John R. Liddell was instructed to proceed from the Ouachita River west toward Natchitoches. With a force of five thousand, Price reached Shreveport on March 24. However, Kirby-Smith detained the division and divided it into two smaller ones. He hesitated to send the men south to fight Union General Nathaniel P. Banks, who he believed outnumbered the Confederate forces. This decision was opposed by General Richard Taylor. Price marched back into Arkansas to oppose General Frederick Steele's Camden Expedition but was defeated at the Battle of Prairie D'Ane and the Battle of Jenkin's Ferry. By this time, the western campaign was nearing its conclusion. Despite his disappointments in Arkansas and Louisiana, Price convinced his superiors to permit him to invade Missouri in the fall of 1864, hoping yet to seize that state for the Confederacy or at the very least imperil Abraham Lincoln's chances for reelection that year. 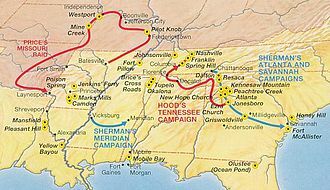 Confederate General Kirby Smith agreed, though he was forced to detach the infantry brigades originally detailed to Price's force and send them elsewhere, thus changing Price's proposed campaign from a full-scale invasion of Missouri to a large cavalry raid. Price amassed 12,000 horsemen for his army, and fourteen pieces of artillery. The first major engagement in Price's Raid occurred at Pilot Knob, where he successfully captured the Union-held Fort Davidson but needlessly subjected his men to high fatalities in the process, for a gain that turned out to be of no real value. From Pilot Knob, Price swung west, away from St. Louis (his primary objective) and toward Kansas City, Missouri and nearby Fort Leavenworth, Kansas. Forced to bypass his secondary target at heavily fortified Jefferson City, Price cut a swath of destruction across his home state, even as his army steadily dwindled due to battlefield losses, disease, and desertion. Although he defeated inferior Federal forces at Fourth Battle of Boonville, Glasgow, Lexington, the Little Blue River and Independence, Price was ultimately boxed in by two Northern armies at Westport, located in today's Kansas City, where he had to fight against overwhelming odds. This unequal contest, known afterward as "The Gettysburg of the West", did not go his way, and he was forced to retreat into hostile Kansas. A new series of defeats followed, as Price's battered and broken army was pushed steadily southward toward Arkansas, and then further south into Texas. Price's Raid was his last significant military operation, and the last significant Confederate campaign west of the Mississippi. Rather than surrender, Price led his followers to Carlota Cordoba, Mexico. There he and several of his Confederate compatriots attempted to start a colony of Southern exiles, which failed miserably. As noted, Price did not surrender, but fled into Mexico. There he unsuccessfully sought service with the Emperor Maximilian. He settled in a Confederate exile colony in Carlota, Veracruz. When the colony failed, he returned to Missouri. While in Mexico, Price started having severe intestinal problems, which grew worse in August 1866 when he contracted typhoid fever. Impoverished and in poor health, Price died of cholera (or "cholera-like symptoms") in St. Louis, Missouri. The death certificate listed the cause of death as "chronic diarrhea". Price's funeral was held on October 3, 1867 in St. Louis, at the First Methodist Episcopal Church (on the corner of Eighth and Washington). His body was carried by a black hearse drawn by six matching black horses, and his funeral procession was the largest to take place in St. Louis up to that point. He was buried in Bellefontaine Cemetery. In his paper "Assessing Compound Warfare During Price's Raid", written as a thesis for the U.S. Army Command and General Staff College, Major Dale E. Davis postulates that Price's Missouri Raid failed primarily due to his inability to properly employ the principles of "compound warfare". This requires an inferior power to effectively use regular and irregular forces in concert (such as was done by the North Vietnamese and Viet Cong against the French and Americans during the Vietnam War) to defeat a superior army. He also blamed Price's slow rate of movement during his campaign, and the close proximity of Confederate irregulars to his regular force, for the defeat. Davis observes that by wasting valuable time, ammunition and men in his relatively meaningless assaults on Fort Davidson, Glasgow, Sedalia and Boonville, Price offered Union General Rosecrans time he might not otherwise have had to organize an effective response. Furthermore, he says, Price's insistence on guarding an ever-expanding wagon train of looted military supplies and other items ultimately became "an albatross to [his] withdrawal". Price, said Davis, ought to have used Confederate bushwhackers to harass Federal formations, forcing the Unionists to disperse significant numbers of troops to pursue them over wide ranges of territory—which in turn would have reduced the number of effectives available to fight against Price's main force. Instead, Price kept many guerrillas close to his army, even incorporating some into his ranks, largely negating the value represented by their mobility and small, independent formations. This in turn allowed Union generals to concentrate a force large enough to trap and defeat Price at Westport, effectively ending his campaign. While the scope of Davis' research is limited to Price's Missouri expedition, it provides some insight into Price's tactical and strategic mindset, together with a sense of some of his strengths and weaknesses as a general. While devoted to the Southern cause, Price's goals in his Confederate military operations were directed to liberating his home state of Missouri. Although he achieved victories during all phases of the war, his strategically most important battles (other than Wilson's Creek) all ended in defeat. During the Civil War, a wooden river steamer built at Cincinnati, Ohio, in 1856 as the Laurent Millaudon was taken into Confederate service and renamed the CSS General Sterling Price. Participating in actions near Fort Pillow, Tennessee on May 10, 1862, she damaged two Federal gunboats before being temporarily put out of action. The General Price was sunk during the Battle of Memphis, raised, repaired, and served in the Union Navy under the name USS General Price although she was still referred to as the "General Sterling Price" in Federal dispatches. As a Union ship, she served in the Vicksburg and Red River campaigns. The Price was sold for private use after the war. A statue of Price stands in Price Park, Keytesville, Missouri, which is also the location of the Sterling Price Museum in his honor. The Keytesville chapter of the SCV Post #1743 annually hosts Sterling Price Days, with a festival and parade. A monument to Price stands in the Springfield National Cemetery (Springfield, Missouri). Dedicated August 10, 1901, the bronze figure honors all Missouri soldiers and General Price. It was commissioned by the United Confederate Veterans of Missouri. The United Daughters of the Confederacy (UDC) commissioned Jorgen Dreyer in 1939 to create a bust of Price. It is in the Visitor Center of the Battle of Lexington Missouri Historic Site. An orange tabby cat was named for him in the John Wayne movies, True Grit and Rooster Cogburn, as Cogburn's alcoholic cat. ^ a b Sterling Price[permanent dead link]. Retrieved on November 22, 2009. ^ Pictorial and Genealogical Record of Greene County, Missouri, entry: "General Sterling Price"; The Library, Springfield, Missouri. Retrieved on November 24, 2009. ^ Pollard 1867, p. 155. ^ "The Battle of Wilson's Creek", Civil War Trust. Retrieved April 9, 2016. ^ "Sterling Price (1809–1867)", The Latin Library. Retrieved on November 26, 2009. ^ Welsh, Jack D. (1995). Medical Histories of Confederate Generals. Kent, Ohio: Kent State University Press. p. 177. ISBN 0-87338-505-5. ^ Shalhope, Robert E. (1971). Sterling Price: Portrait of a Southerner. Columbia, Missouri: University of Missouri Press. pp. xi, 290. ISBN 978-0-8262-0103-4. ^ Sedalia (MO) Democrat, p. 10, September 17, 1939. Castel, Albert. General Sterling Price and the Civil War in the West. Baton Rouge, Louisiana: Louisiana State University Press, 1968. ISBN 0-8071-1854-0. Geiger, Mark W. (2010). Financial Fraud and Guerrilla Violence in Missouri's Civil War, 1861–1865. New Haven, CT: Yale University Press. ISBN 978-0-300-15151-0. Shalhope, Robert E. Sterling Price, Portrait of a Southerner. Columbia, Missouri: University of Missouri Press, 1971.